I took a few macro photos of moss today, but when I loaded up my memory card into light room, I saw this image. When did I take that? How quickly my memory fades. This was the scene very early yesterday morning, before sunrise. 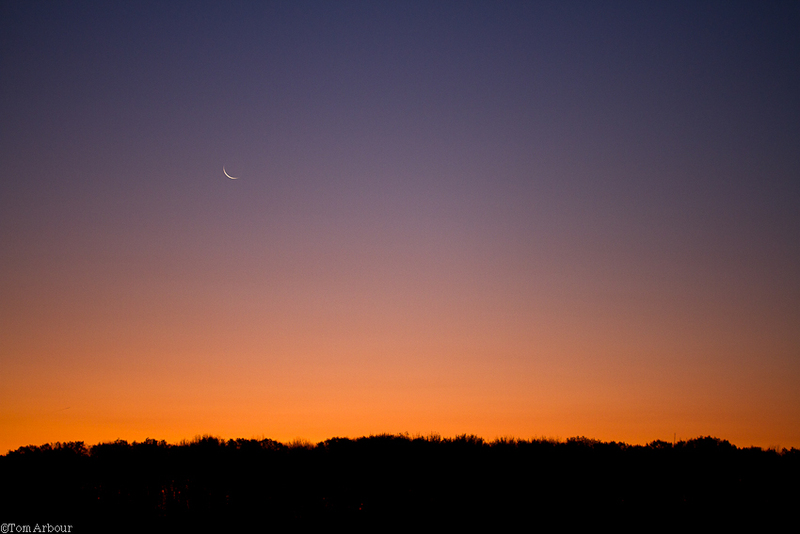 A perfect crescent moon- I would have completely forgotten this memory had I not photographed it. Tom: Cool shot of the moon. Great shot, Tom. I don't know if I'm imagining it, but I can almost trace the outline of the whole moon from your image. Good catch! Scott- I o think you can see the entire moon. If I get sick of the bluejackets game, I may go downstairs and post a crop of the moon to see huts how much of the rest of the disc is visible. Well, I did the crop- and you can barely see the outline, but not any better than you can in the above image. I decided not to post it. Isn't the moon cool? The moon is SO cool!